Hustling awesome stuff since 2008. The Urban Art team Low Bros consists of two brothers, Qbrk and Nerd, born in Hamburg, northern Germany. They’re currently live and work in Berlin. When they where children the two brothers loved to draw and invented their own little stories and fantasy worlds while playing in the backyard or being on the countryside. You’ll still find both influences, the urbanic and natural in their today’s works. Later they started to paint graffiti, where also co-founders of the TPL Crew and The Weird, which was founded together with Nychos, Cone, Hr. v. Bias, Dxtr, Rookie, Look and Vidam from Peachbeach and Frau Isa. All times the brothers painted together, but it took a while till they began to create their characters together and developed their own, common, geometric style. 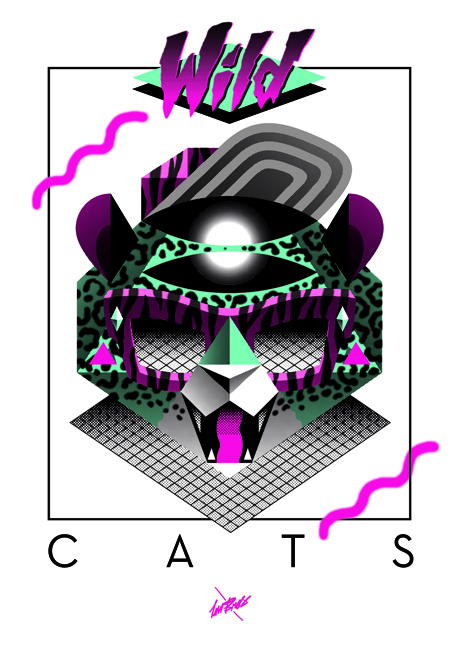 Ever since they go by the name Low Bros.
“Wild Cats” is the new show from Low Bros coming up tomorrow night, July 5th, at Montana Shop & Gallery Lisboa by 9 p.m. Be there! Start time: Thursday, July 5th 2012 by 21 p.m. Location: Montana Shop & Gallery Lisbon – Rua da Rosa, 14 G – Bairro Alto, Lisboa.